Māori and Pākehā still talk past one another, if indeed Māori and Pākehā talk to each other, much less listen. Moreover, the relationship is structured according to a grossly uneven power play. White privilege in all its blind glory. Pākehā get all the air time. Māori have no option but to listen. But should we really call the whole thing off? A great number of us come together every April 25th. We lay wreaths, we remember the sacrifices made by our service men and women, by our aunties and uncles, grandparents and parents. Our World Wars story is one that, though not without its critics, binds us together, where ‘the colour bar’ magically melts away into the waves crashing down on ANZAC Cove. We have good reason to commemorate our war veterans and heroes, our ancestors who made the supreme sacrifice so that we can live as we do today in something like a free, democratic society. More research is needed in order to expose the racism and prejudice against Māori that existed in World War I and II. That said, it is much easier for all New Zealanders to commemorate ANZAC Day and the theatres of war that happened elsewhere, than the conflicts that raged over Aotearoa in the mid to late nineteenth century. As historian Danny Keenan has pointed out, New Zealand doesn’t know what to do with its own history. And so, the New Zealand Wars brood in awkward silence on the knife-edge of national consciousness. What do we do with the knowledge that Waikato was invaded by a British Imperial force so set on the destruction of Māori life-ways that the proclamation of war was issued after the invasion commenced? How do we teach our children that Māori men, women and children were wrongfully attacked, raped, murdered, killed, maimed and hunted down by white soldiers and settler militia and that their descendants reap the benefits of this destruction today? How do we talk about the massacre at Rangiaowhia and the mythologising that began before the dust had even settled on the ramparts of Ōrākau? What and how should we as New Zealanders remember? Not forgetting, of course, that Māori are New Zealanders too. And remembering that Māori have carried the weight of these ‘awkward’ episodes in our past on their own. Whānau tell and retell the narratives at tangi, at hura kōwhatu, at trust meetings, at committee meetings, on marae with tea and fried bread, in homes, in schools, in churches. Field trips built into language learning and other wānanga take in sites of significance to the people. History is both ‘storied’ and ‘placed’. Young and old, male and female, babies, cuzzies, all and sundry jump on the bus/minivan/car/ute/bike/waewae express to hear the kōrero and become part of the history themselves. Waiata such as ‘E Pa Tō Hau’ express the feelings of the people then and now. Every couple of years historian Tom Roa (Ngāti Maniapoto, Waikato) takes his whānau on a pilgrimage through Waikato. His father’s tupuna fought at Rangiriri, his mother’s great grandmother was at Rangiaowhia and her tūpuna were also at Ōrākau. Māori have been talking to themselves for decades. Power is real. So is work. Last summer I visited Rangiaowhia on my own personal pilgrimage armed with nothing but an entry-level, DSL camera. The rich, fertile earth Ngāti Apakura called home once laid out with peach groves, orchards, and acres of maize and wheat now ordered by fence and hedge, paddock after desolate paddock. 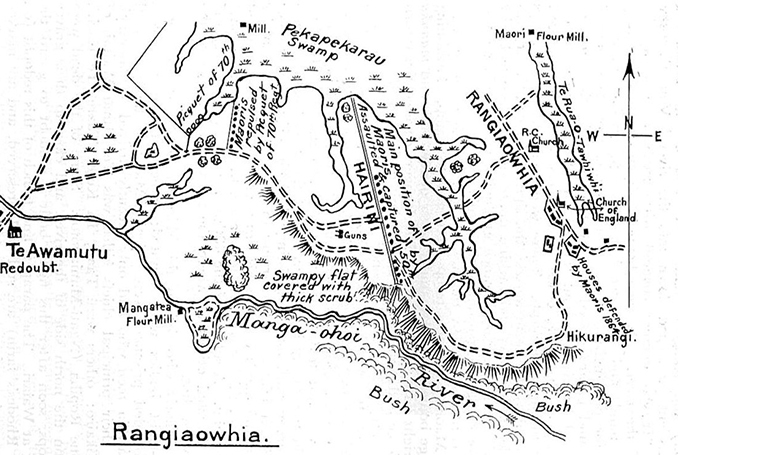 Rangiaowhia; the undefended village where women, children and the elderly were sent to wait out the fight that never came to Pāterangi; the site where an elderly Māori man with a white blanket raised above his head was shot down in a hail of bullets while attempting to exit a burning whare; the site where two more Māori attempting to escape the fire met the same fate; the site where the bodies of seven Māori were later found in the gutted ruins; the site where the people say upwards of 100 Māori villagers died on 21 February 1864. Terrorism. Mayhem. Mamae. Happened. Here. It wasn’t easy to go. It was hard. But I went. I went to work. For myself, on myself – to try to understand, or make some kind of sense of, the things that happened. Here. To them. To us. As I was about to leave St Paul’s church, the little wooden survivor of the atrocities committed that Sunday morning in 1864, a Pākehā woman of a certain age stopped me to share her news. I nodded and forced a half smile while she cheerfully informed me that her son was getting married there in two weeks’ time. The wedding party were on their way to practice for the ceremony. It was all so wonderful. They were all so thrilled about it. Then she looked me in the eyes sheepishly and confessed, ‘It’s sad what happened to your people here.’ Your people. Her eyes appealed for forgiveness. Or something. I was there for work. She clearly wasn’t. The New Zealand Wars and all its bitter, confusing, traumatic legacies is hard work for all New Zealanders, not just Māori, to take up. The abusive relationship that the Māori partner is locked into will remain the status quo while their Tiriti partner continues to shirk their share of the labour, of the effort required to enjoy a meaningful, satisfying, respectful partnership. 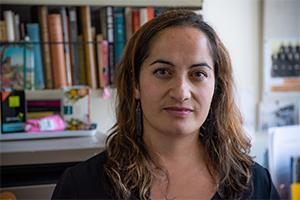 Arini Loader (Ngāti Raukawa, Ngāti Whakaue, Te Whānau-a-Apanui) is a lecturer in History at Victoria University of Wellington Te Whare Wānanga o Te Ūpoko o Te Ika a Māui. Her research interests include Māori and Indigenous history, languages and literatures. She is currently working on a research project with her Vic colleague Mike Ross on a collection of waiata, karakia, whakataukī and kōrero recorded by Māori taken captive from the battle of Rangiriri in 1863. She suffers the occasional bout of cacoethes scribendi.